WOW . 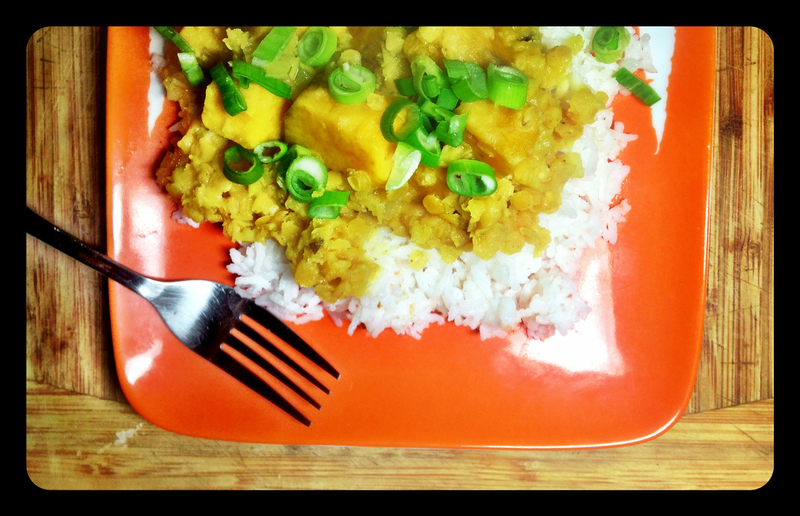 . . this dish packs quite a lot of flavor and spice. I like spicy food, and I had to keep my yogurt nearby. Although the best part about this recipe is that it is made in a slow cooker. Slow cookers are one of my favorite pieces of kitchen equipment (that and my immersion/stick blender; both of which are used in this recipe). There is nothing better than coming home after a long day of work to a warm meal that has been slowly bubbling away for hours cooking down and gaining flavor. Usually, most recipe books for slow cookers are very meat-centric, so usually I just make up my own concoctions, but it is always nice to get inspiration from somewhere. 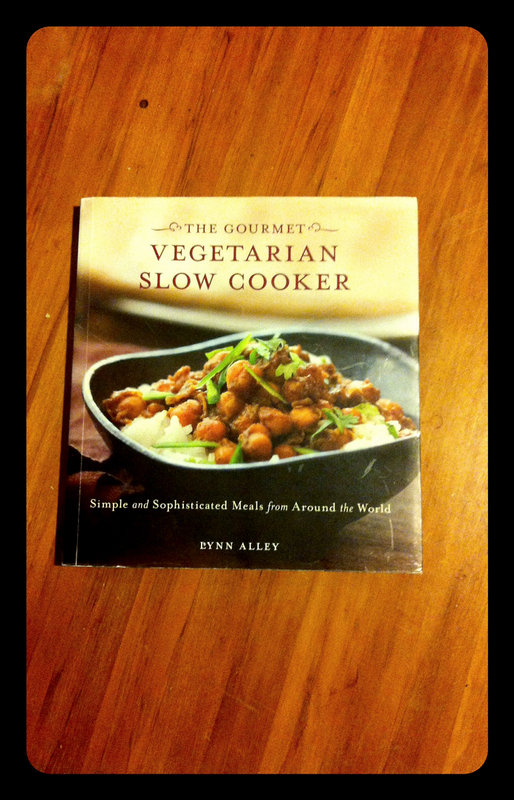 A couple years ago a friend gave me The Gourmet Vegetarian Slow Cooker cook book as a birthday present. This is literally one of the best birthday presents I have ever received!! The book is organized by country and it has so many amazing recipes for ways to use a slow cooker that I have never imagined. Chickpeas or Chana are commonly found in Indian cooking, especially vegetarian Indian cooking. With this recipe there is still a bit of work to be done at the end; the spices and fresh ingredients are added last after the chickpeas have been simmering all day to preserve the flavor and the freshness of these elements. As I mentioned earlier this recipe is SPICY!! 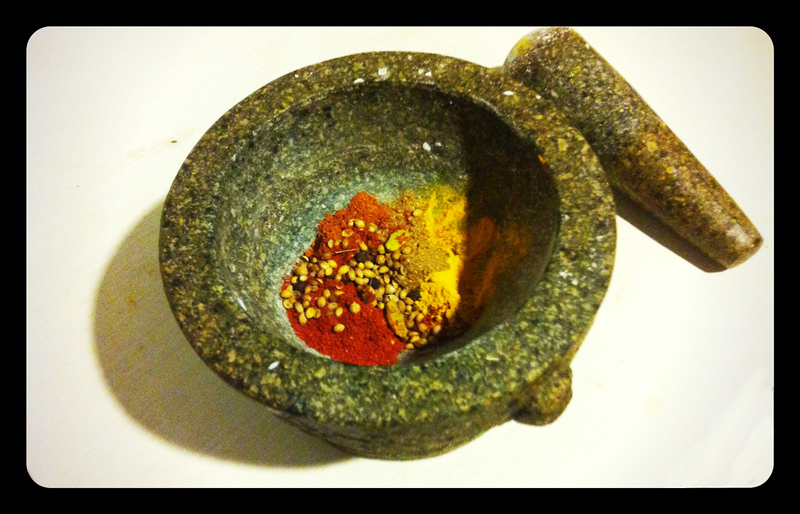 You can adjust it for your own spice tolerance by varying the amount of cayenne pepper used. Thoroughly rinse the chickpeas and place them in the slow cooker insert along with the water. 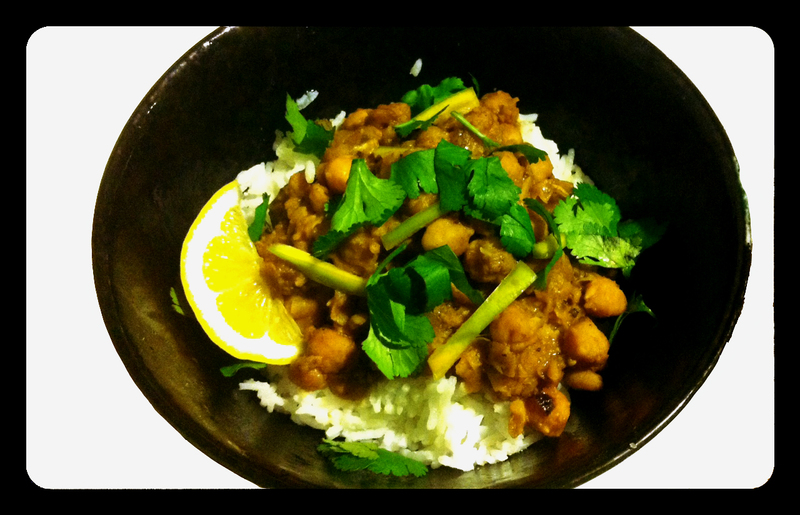 Cover and cook on low for 6 to 8 hrs (pretty much while you are at work), until the chickpeas are tender. In a large saute pan, brown the onion in the sesame oil until dark brown in colour, about 10 -15 min. Now the fun part . . . combine the cumin seeds, peppercorns, cloves, cardamom, chile powder, ginger, turmeric, garam masala, and cayenne in an electric coffee mill or mortar and pestle and grind to a coarse powder/paste. If you do not have either an electric coffee mill or mortar and pestle then put spices into a heavy bowl and use the bottom of a glass or jar to grind the spices down. I love the look and smell of all these beautiful spices combining together. Add the coarsely ground spices to the onion and continue to cook for another 5 minutes, then add the onion and spices to the cooked chickpeas. Recover and continue cooking for another 30 – 60 minutes. Using an immersion/stick blender, puree some of the chickpeas in the insert, and mix through to thicken the mixture. Add salt to taste, then stir in the lemon juice. Ladle into bowls, add a dallop of yogurt, and garnish with chile slices and fresh coriander.